I’m still not sure how this new landscaping is supposed to work. My best guess is that the lower area is supposed to collect runoff and seepage from the surrounding lawn and other plants (and the street gutter behind me, interestingly enough) in order to reduce water usage and actually do something with water that would otherwise be sent into storm drains — a good idea in drought-stricken California. 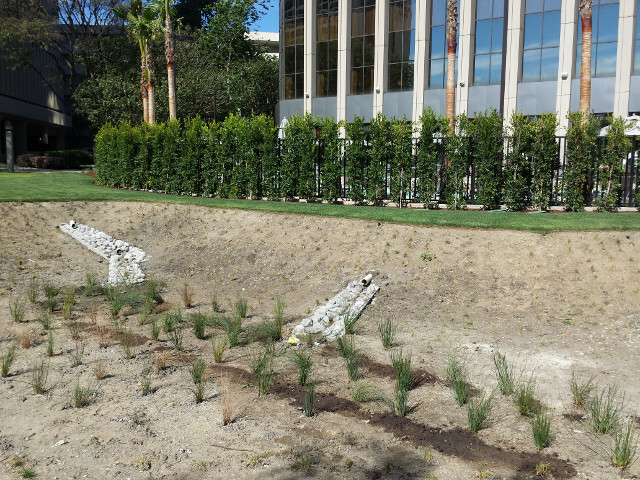 This entry was posted in Photos and tagged drought, Los Angeles, plants on March 14, 2015 by Kelson. They tested whether cress seeds would germinate near a wi-fi router. The seeds by the router DID grow, just not as well as the control group. The photos accompanying the news articles I saw don’t match the photos that appear in the report. They actually look like a before and after set. It was done a year ago, in spring 2013. It was a school science project. That’s not a knock, they did some good things like sending traffic through the router to make sure it was actually transmitting, and mixing seeds from multiple packets together to eliminate differences between batches. As with all science, the results need to be repeated in more experiments with rigorous controls to be sure they accounted for all variables. I couldn’t find a followup study in all the blind repostings of the original OMGWIFI claims, though I did find a discussion at JREF. If you can read past the annoyingly dismissive comments, you’ll also find some insightful remarks and links to the actual presentation (in Danish, so it’s tricky to read, but they have charts and photos)…and a few anecdotal stories by people who use the heat from their wireless routers to HELP germinate seeds! After we read up on this, Katie decided to do a simple experiment herself. She put seeds next to our router, on top of our refrigerator, next to the TV, and for a control, outside. She found that the seeds placed next to our router did just fine — considerably better than those left outside, and slightly better than those placed elsewhere around the house. 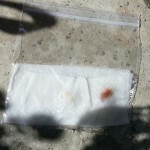 Each bag contained one kidney bean, one black-eyed pea, and one seed from the red bell pepper I cut up for dinner. 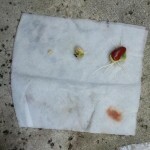 I put a section of select-a-size paper towel, folded twice, in each and set the seeds inside the second fold. 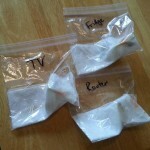 Each bag got 15 mL of Brita filtered water and the air was squeezed out before sealing. Then I left them around the apartment for several days to see if they’d sprout. This is a picture of what resulted. The seeds outside sprouted a little bit. The seeds on top of the fridge sprouted OK. 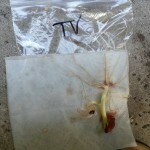 The seeds by the TV sprouted as well. The seeds by the router actually sprouted better than any of the others. I wonder if the seeds in the school experiment just dried out. 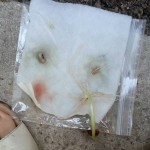 Katie sealed her seeds in plastic bags, which allowed radiation to pass through, but trapped moisture. As I understand it, the students watered their seeds throughout the experiment, but it’s possible the trays dried out overnight. Comparing moisture content/retention would be an interesting follow-up. Obviously, this isn’t any more rigorous than the original experiment. But it shows that the results they found are the beginning of the process, not the last word. More importantly, it’s something you can easily test yourself if you’re so inclined. Next time you see a startling claim that’s something you can test without too much trouble, try checking it out for yourself. Incidentally: We planted the seeds in our patio yesterday. With any luck, they’ll do as well as our tomatoes (and better than our poor carrots) this year! 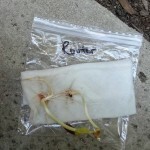 This entry was posted in Computers/Internet and tagged plants, radiation, science, WiFi on June 24, 2014 by Kelson. Garden Show Centerpiece, originally uploaded by Kelson. I braved South Coast Plaza this Saturday, and ended up in the middle of the Spring Garden Show, which took up all the non-store space in the wing formerly known as Crystal Court. I ended up wandering the garden show for a bit. First floor was mostly furniture and decorations. 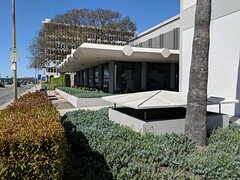 The second and third floor were mostly people selling or showing off plants of various types, tools, pots, etc., with half of the third floor dedicated entirely to orchids. There was also this huge centerpiece in the middle of the mall. Coincidentally, I was looking through old photos from one of our trips to Las Vegas earlier that day and found the pictures of the giant flower-and-insect display in the Bellagio. 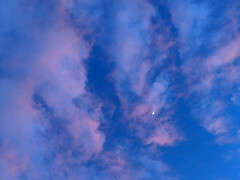 I’ve posted a few photos taken with my phone. 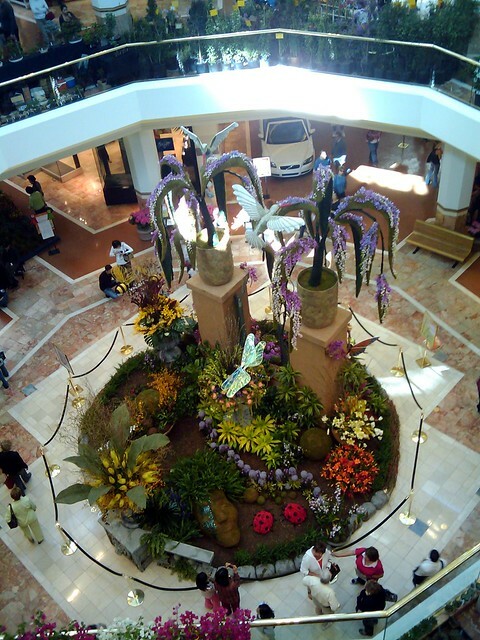 This entry was posted in Photos and tagged garden, mall, Orange County, plants on April 26, 2009 by Kelson. After our trip to the nursery this weekend, Katie started seriously looking at our existing plants. We have a mint plant that got so pot-bound it grew down, through the drainage holes at the base of the pot, and back up the outside of the pot. She decided to make cuttings out of those bits… but what to put them in? This entry was posted in Food, Humor and tagged chocolate, mint, plants on March 30, 2006 by Kelson.